During Old Navy Black Friday 2016, visit your local Old Navy because you could win $100K or thousands of daily prizes during the Old Navy 100K Giveaway, a new Old Navy Sweepstakes launching on November 18th. Grab a scratch card in-store and claim your prize by entering your promo code at OldNavy.com/RedeemHappy. It’s that easy so be happy! 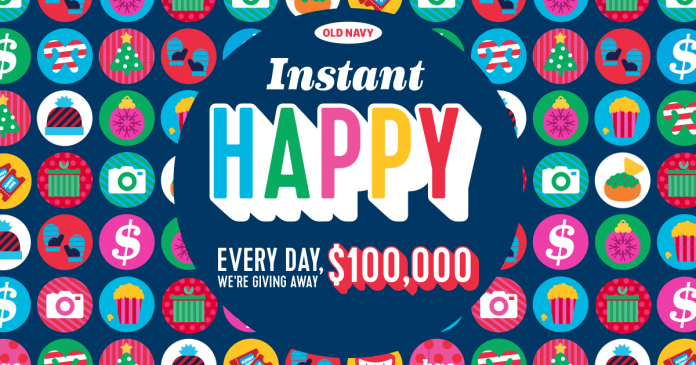 Old Navy will give away a $100K grand prize every day for 8 days. Plus, you could win over 3,000,000 digital codes good for Fandango movie tickets, free Chipotle chips and guacamole, and more. With over $5,000,000 in prizes, there’s something for everyone! Be sure to head to an Old Navy near you between November 18th and November 25th for your chance to win! What Is This Old Navy 100K Giveaway? The Old Navy 100K Giveaway consists of a Sweepstakes, an instant win game and a program. The Sweepstakes is open only to legal residents of the 50 United States (including District of Columbia and Canada who are at least 18 years old at the time of entry. The Instant Win Game is open only to legal residents of the 50 United States (including District of Columbia) who are at least 18 years old at the time of entry. The Program is open only to legal residents of Canada who are at least 18 years old at the time of entry. Sponsored by The Gap Inc., Two Folsom Street San Francisco, CA 94105 U.S.A. Administrated by HelloWorld, Inc., 3000 Town Center, Suite 2100, Southfield, MI 48075 U.S.A. The Old Navy 100K Giveaway begins on November 18, 2016 at 12:00 a.m. ET and ends on November 25, 2016 at 11:59 p.m. ET. 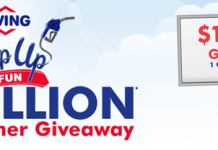 The Sweepstakes begins on November 18, 2016 at 12:00 a.m. ET, ends on November 25, 2016 at 11:59 p.m. ET and consists of 8 daily entry periods. Each Daily Entry Period begins at 12:00 a.m. ET and ends at 11:59 p.m. ET. The Instant Win Game and Program begins on November 18, 2016 at 12:00 a.m. ET, ends on December 9, 2016 at 11:59 p.m. ET and consists of two (2) phases as outlined below. Entry Phase: Between November 18, 2016 and November 25, 2016. Redemption Phase: Between November 18, 2016 and December 4, 2016. The drawing for each Daily Entry Period will be conducted on Sponsor’s behalf by Administrator at approximately 12:00 p.m. on the next business day following the conclusion of the applicable Daily Entry Period in Southfield, MI U.S.A. Non-winning Daily Entry Period entries will not carry over into subsequent Daily Entry Period drawings. There will be 3,728,400 random game pieces distributed during the Entry Phase, you will be a potential winner of the prize indicated on the game piece. The total approximate retail value of all prizes is $5,029,950.00 USD. For a winner list, visit http://bit.ly/2cOT3m0. The winner list will be posted after winner confirmation is complete. 8 GRAND PRIZES (one (1) awarded per Daily Entry Period): A $100,000 check. 100,000 FIRST PRIZES: $25 off a Tiny Prints purchase awarded as a code. Odds of winning a First Prize are approximately 1:38.09. 500,000 THIRD PRIZES: Free Chipotle chips and guacamole awarded as a digital code. Odds of winning a Third Prize are approximately 1:7.62. 5,000 FOURTH PRIZES: 55 Coke Rewards that can be redeemed online for a free drink. Odds of winning a Fourth Prize are approximately 1:761.76. 3,118,800 FIFTH PRIZES: An Old Navy free shipping code awarded as a digital code. Odds of winning a Fifth Prize are approximately 1:1.19. Visit an Old Navy store location in the U.S. and make a purchase to receive a scratch off card. You may also simply ask a store associate for one scratch off card. Once you receive your scratch off card, scratch the surface to reveal a prize (for residents of the U.S.) or an Old Navy free shipping code (for residents of Canada). Each game piece will contain a unique code. During the Redemption Phase, locate the unique code and visit www.oldnavy.com/RedeemHappy (for residents of the U.S.) or www.oldnavy.ca/RedeemHappy (for residents of Canada) and follow the links and instructions to redeem your prize or your offer. Each U.S. entrant may redeem up to 2 Instant Win Game prizes per day during the Redemption Phase regardless of method of entry. Each Canadian entrant may redeem up to 2 Offers per day during the Redemption Phase. Once you obtained a game code, visit either www.oldnavy.com/RedeemHappy (for U.S. entrants) or www.oldnavy.ca/RedeemHappy (for Canadian entrants) and complete and submit the registration form including the code from the game piece and a valid email address. You automatically will receive one entry into the applicable Daily Entry Period drawing. To participate without making a purchase, visit www.oldnavy.com/winhappy (for U.S. entrants) or www.oldnavy.ca/winhappy (for Canadian entrants) and complete and submit the registration form including a valid email address. You automatically will receive one entry into the applicable Daily Entry Period drawing. Each entrant may receive up to 2 entries per day during the Sweepstakes Period regardless of method of entry. For complete details, see the officials rules starting November 18, 2016. Previous article2 Broke Girls Word Of The Day: Here’s The Shake Flavor For Today! I think it was a way for them to get more ppl in the store! And feel like the others who believed like did this to be true. Thanks for the support of other customers. no place to put the code? Not a good thing. I have been on Old Navy website 30 minutes so far..where do you put the code,went on different sites same thing.. Enter your code in the field at the top of the page. Good luck! I have won free shipping in old navy give away. But I can’t find anywhere to place my code.